Is this Maui’s best day trip? Moloka‘i island near Maui, Hawai'i. Separated by the Auau Channel, Maui, Moloka‘i, and Lana‘i are known as Maui Nui (Maui County). 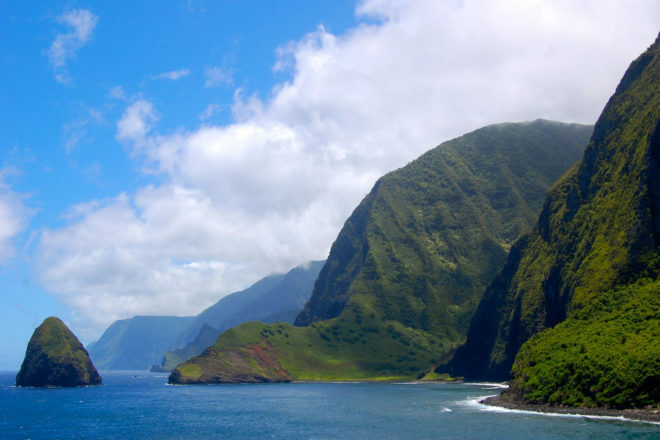 Moloka‘i and Lana‘i are accessible by a short ferry ride from Lāhainā on Maui’s west coast. Here’s what to do when you arrive…. The southern shore of Moloka‘i is home to Hawai‘i’s longest reef; dive here to see a spectacular underwater world of colour. Hop on a mule (yes, a mule) on Moloka‘i to explore Kalaupapa National Park. Get your snokel on at Lana‘i’s protected Hulopo‘e Bay, but not in winter when things can get a bit rough. Do a 4WD tour of Lana‘i’s Garden of the Gods, a volcanic lunar landscape in Keahiakawelo. Wander around the quaint former plantation town of Lanai City for unique shopping and local dining.